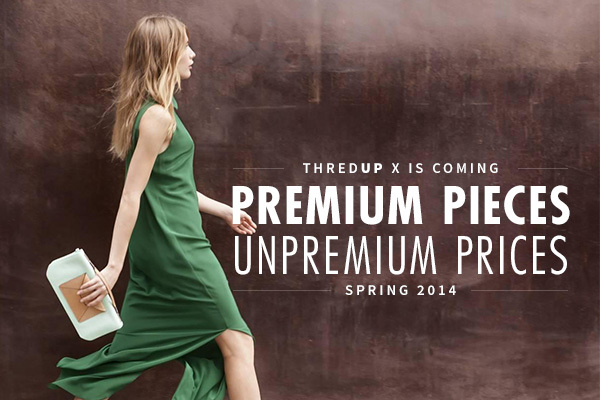 Hot on the heels of announcing that handbags are coming to thredUP, we’re thrilled to tell you about something else we’re working on: thredUP X, our exclusive collection of women’s premium pieces from designer brands. Beginning today, you can sell women’s premium and designer items on thredUP and receive premium payouts. Be sure to sign up to be the first to know when the thredUP X Shop opens. In the meantime, though, order a Clean Out Bag to start selling! Premium Payouts for your Premium Pieces. We know it’s hard to part with pieces you’ve splurged on, which is why we’re paying you more for the premium designer styles in your closet! You will receive consignment payouts of up to 80%, the highest in the industry. Plus, our consignment pricing structure lets you weigh in on the initial listing price so you have more control over the sale of your item. Bonus: To celebrate the launch of thredUP X we will give you $10 shopping credit for every qualifying thredUP X item you send us. What Items Qualify for thredUP X? If you’re a trendsetter and are always shopping the latest designer styles, the items in your closet are perfect for thredUP X. Apparel, shoes, handbags and accessories from designers like Kate Spade New York, Marc by Marc Jacobs, Joie, Hudson, Tory Burch, rag & bone, J Brand, Milly and Tibi are a few examples of brands that fit the bill. Generally speaking, these pieces sell brand new starting at $150. Visit our Clothing Calculator to learn more about brands we accept and the payouts you can expect for your items. A New Dimension to the thredUP Shopping Experience. Most thredUP customers visit us frequently, shopping for stylish basics and wardrobe staples to outfit their family. thredUP X will bring a new dimension to your thredUP shopping experience, allowing you to complement your wardrobe with stunning designer pieces. The designer looks you thought you couldn’t afford will soon be attainable on thredUP! And your favorite mainstream brands – like GAP, American Apparel, H&M – aren’t going anywhere (we love them, too! ), so thredUP will be your one-stop shop for creating high-low fashion ensembles. With the introduction of thredUP X, we’re furthering our commitment to helping women live in an UP world. Our team’s passionate about helping you shop and style smarter because high fashion price tags shouldn’t prevent you from wearing the styles you love. When Can You Shop thredUP X? The thredUP X shopping experience is coming very, very soon! Sign up here for exclusive updates on the launch. Spread the word and you’ll earn $5 shopping credit for every friend who signs up! A note on timing: We will be building our thredUP X inventory in advance of opening the Shop, so it will take a few weeks for your items to go on sale. If you have any questions about thredUP X and consignment pricing please contact support@thredup.com.